Bounce off again from 0.59 on 1st July. ThaiBev: Will It Resume Mid-Term Uptrend? Standard Chartered Bank issued report on July 5th with target price of 0.75cents. What happen? Sudden drop today. downgrade by USB to 0.51.
analyst are not gods. they just guesstimate. analyst call usually post target price for one year timeframe so it may go up to 0.8 in 1 year time coz they are long term investor perspective. Any advice on this counter? Nirgunan who has a “buy” call and price target of 75 cents......???? Thai Bev might fall to 44-45 tomorrow for a good profitable bounce. 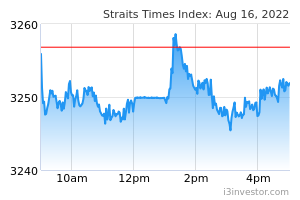 SINGAPORE share prices fell by noon on Tuesday with the Straits Times Index down 21.38 points to 3,063.03.
good call on thai Bev bounce . buy after pullback at 0.46-0.47? morning me gave support when price dip base on TA chart. good for a small run again? good small run......slow run up to 0.55? Closing bell 0.500 +0.035. hmmm no latest news on myanmar saga? Thai finance ministry will increase excise tax ceiling rates on beer, wine, whiskey and other alcoholic beverages by an average of 7%-8%.......For example, the excise tax for beer is 48%, based on the value (ad-valorem) calculation, while the tax rate for white spirits is only 4%. Both of them are in similar tax brackets in terms of alcohol content per litre (155 and 145 baht per litre). Thai Beverage is the country's largest white spirit producer. Last min run up from 0.495 to 0.505....??? what is the support for this stock? 0.44?